The International Space Station, which was crowded last weekwith 12 astronauts onboard, is set to go down to a crew of two Tuesday. Seven astronauts departed the station Nov. 25 on the spaceshuttle Atlantis, and now three more station residents are set to undockfrom the orbital outpost Monday at 10:56 p.m. EST (0356 GMT Tuesday) to land theirRussian Soyuz spacecraft at 2:16 a.m. EST (0716 GMT) Tuesday in Kazakhstan. The barebones remaining crew of two ? NASA astronaut JeffWilliams and Russian cosmonaut Maxim Suraev ? will be left to handle the spacelaboratory themselves for about three weeks. "Jeff once told me that this will be the besttime," Suraev said during an in-flight news conference last week. "Rightnow we have so many people onboard, so I haven?t had the chance to be onboardwith just two crewmembers. What we're planning to do is just the regular work,our regular activities." The two spaceflyers will each have more daily maintenancejobs than they do when the normal crew ofsix long-term residents is at the station. Though they may have to cut downon the amount of science research they can accomplish, Williams and Suraevshould be able to handle the workload, NASA said. "We won't overload the crew with a lot of tasks,"said Dan Hartman, manager of space station integration and operations. "Wefeel very comfortable going into it." In fact, Williams is an old hand at serving on small crews:He was one of two astronauts working on the space station during Expedition 13in 2003, when shuttle flights were put on hold following the tragic Columbia accident. "I spent three months as part of a crew of two withPavel [Vinogradov], and we had a great time," Williams told SPACE.com. "The loneliness was not an issue. There's so much contact with the ground?that it's not an issue." Williams was recently promoted to commander of the spacestation's Expedition 22 mission after the outgoing commander, Belgian astronautFrank DeWinne, relinquished control during a change-of-commandceremony Nov. 24. "You've set the bar very high for me but also for thosethat follow us," Williams told DeWinne, the first station commander torepresent the European Space Agency. DeWinne is set to end his six-month space voyage and returnto Earth Tuesday along with Expedition 21 flight engineers Bob Thirsk of Canadaand Russian cosmonaut Roman Romanenko. 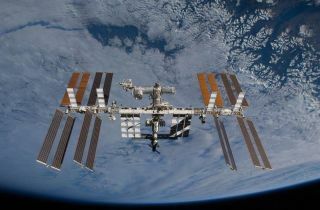 All three have spent 186 days on thestation, overseeing the addition of a new science porch on the station, thearrival of the first Japanese unmanned cargo ship, and three visiting shuttleflights. Williams and Suraev are due to be joined by three morecrewmembers ? Russian cosmonaut Oleg Kotov, Japanese astronaut Soichi Noguchi,and NASA astronaut Timothy Creamer ? arriving on a Soyuz spacecraft Dec. 23.